Deutsch’s DT Series connectors offer field proven reliability in corrosive and rugged environments. Select the terminal that fits your wire size. Use a plug in place of a terminal to fill an empty slot. Crimp terminals with HDT-48-00 crimping tool. Wire Size (AWG) Feature Pkg. Qty. Pkg. Qty. Select the housing that has the number of circuits you need. Each housing requires a wedgelock to hold terminals in place. Use the quick splice to create a single circuit connection between a male and female terminal - no wedgelocks required. Circuits Housing Qty. Wedgelock Qty. Housing Qty. Wedgelock Qty. This kit contains all of the DT series housings, wedgelocks, and pin and socket terminals you need to create a connection - 20 items, over 190 pieces in a metal box. This kit is perfect for maintenance applications where you don't know which pieces you might need. Deutsch Kit contains 72 pieces, housings, wedgelocks, terminals, and 2 removal tools. Comes in a plastic box. Deutsch’s DTM Series connectors are small by design and fit tight spaces. Designed for the same harsh, wet environments as the DT Series. For wire sizes 16 to 20 gauge wire. This kit contains all of the DTM series housings, wedgelocks, and pin and socket terminals you need to create a connection - 31 items, over 200 pieces in a metal box. This kit is perfect for maintenance applications where you don't know which pieces you might need. Deutsch’s DTP Series connectors are the solution for your power application requirements. Building on the DT series design strengths, the DTP connector line was developed for higher amperage applications, up to 25 amps and 12 gauge wire. 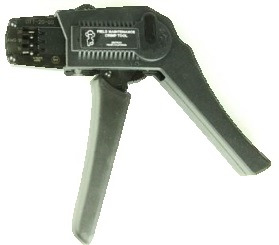 Crimp terminals with HDT-48-00 crimping tool. Select the housing that has the number of circuits you need. Each housing requires a wedgelock to hold terminals in place. This kit contains all of the DTP series housings, wedgelocks, and pin and socket terminals you need to create a connection - 13 items, over 100 pieces in a plastic box. This kit is perfect for maintenance applications where you don't know which pieces you might need. Removal tools remove the Deutsch contacts from their housings. The plastic removal tools are economical. The metal removal tools are more durable. Can't Find the Metri-Pack or Deutsch Terminal/Housing/Seal That You Need?